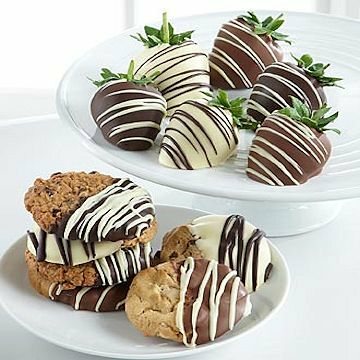 Chocolate Covered Strawberries & Cookie Combo is a gourmet treat that will please with every mouthwatering bite. 6 Sweet, succulent, fresh strawberries and 6 assorted gourmet cookies are hand dipped in the richest milk, decadent dark and heavenly white Belgian Chocolates and decorated with a chocolate drizzle to create an elegant gift of sweet indulgence your special recipient will love. This gift includes the following: Six chocolate covered strawberries and six chocolate drizzled cookies.